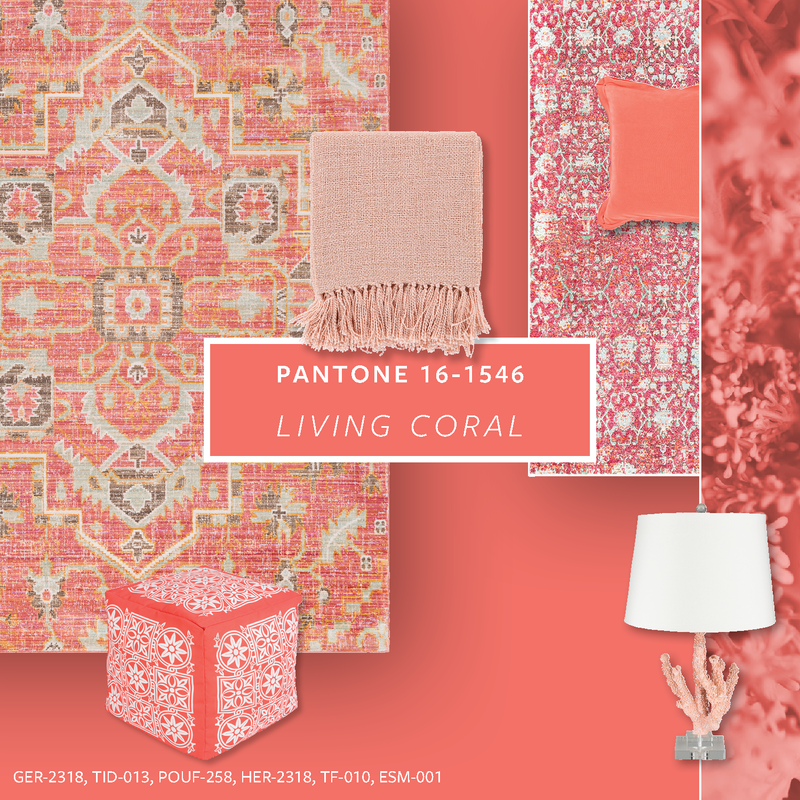 Surya will be spotlighting an array of accessories in Pantone®’s 2019 Color of the Year, Living Coral, at the Atlanta and Dallas winter markets. This “animating and life-affirming coral hue” appears in over 100 Surya accessories across its product categories, including rugs, lighting, textiles, accent furniture, wall decor, and more. Pantone positions Living Coral as a “vibrant yet mellow” color that provides warmth, comfort and buoyancy in today’s ever-changing environment. The color encourages authentic and profound experiences that foster intimate, interpersonal relationships – a sociable and spirited counter response to the imposition that digital technology and social media has created in today's society. “Living Coral is a multifunctional color that can cater to a variety of design styles,” says Satya Tiwari, president of Surya. “We have seen coral tones emerging in our product development research and have brought similar hues to life in our most recent Fall 2017 ‘Harmony’ and Spring 2018 ‘Desert’ trends. It bridges the gap between reds and oranges in a playful, lighthearted manner, making it much more commercially accessible across industries. 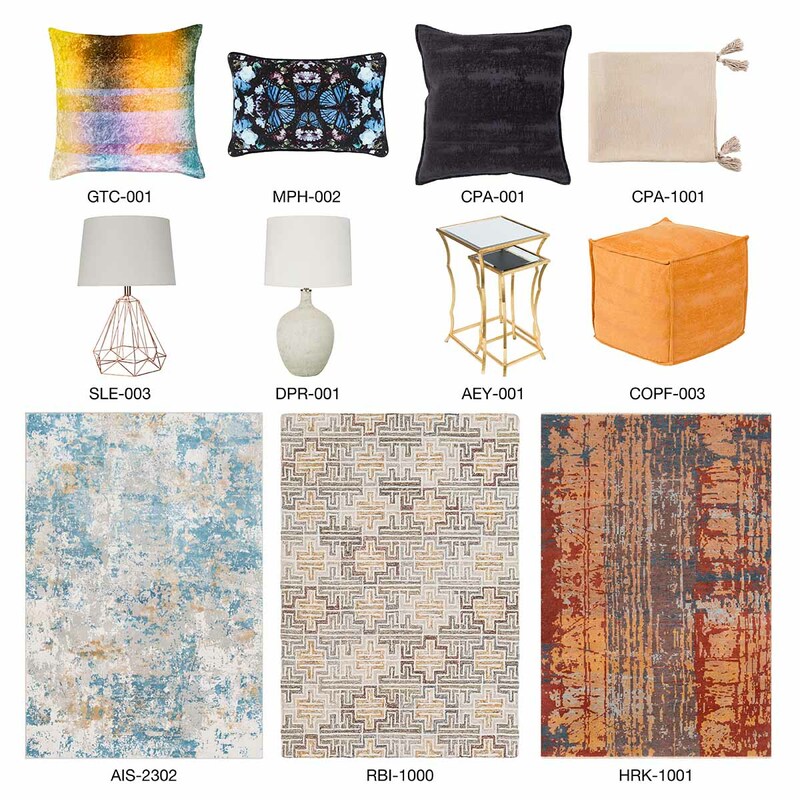 Atlanta and Dallas winter market attendees will have the opportunity to view a collection of Living Coral-hued accessories including rugs, lighting, pillows, poufs, throws, and more in the Surya showrooms. For more information about Surya’s accessories, visit surya.com. View a selection of Surya accessories including Living Coral hues here. Surya founder Surya Tiwari and president Satya Tiwari will be honored by the world-renowned independent cancer research and treatment center with its highest honor, the 2019 Spirit of Life® Award. For the past six years, Surya has been a proud financial partner in the City of Hope’s efforts to fund new research and medical treatments that have led to therapies now used by millions of people facing life-threatening illnesses around the world. The City of Hope Spirit of Life® Award is presented to individuals who exemplify the ideals and values that have guided City of Hope for nearly a century, and whose profession and humanitarian accomplishments are worthy of celebration. The Spirit of Life Award, by its very name, represents intangible qualities that make an individual’s life worthy of admiration: their generosity, their ability to inspire and their desire to make a difference in the world. The awards dinner will take place on April 7, 2019 at the Sheraton Hotel in Greensboro, N.C. In addition to its work with the City of Hope, Surya supports several other local, national and international organizations with health and wellness missions including the March of Dimes, Pain Free Patriots, Blood Assurance, Project Mala, and Akshaya Patra for which Satya is an advisory board member. For more information about Surya’s social responsibility efforts, visit surya.com/social-responsibility. 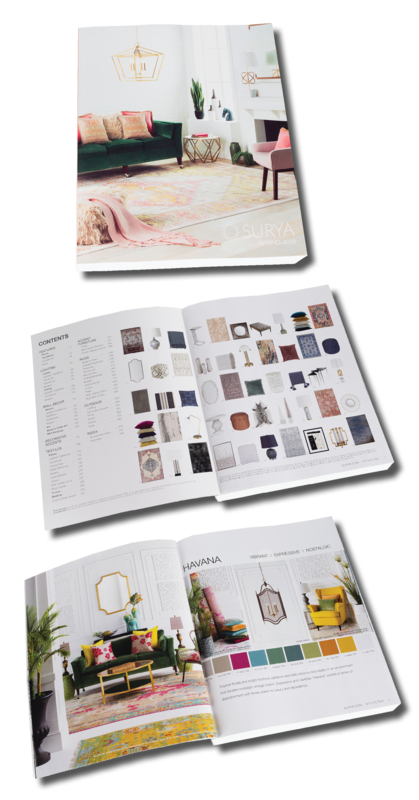 Surya announces the release of its Fall 2018 Catalog. The comprehensive and easy-to-navigate catalog includes more than 1,000 new accessories across all styles and price points; hundreds of new inspirational room scenes and style images; and expanded lighting, textile and wall hangings collections. The catalog opens with the “Surya Spaces Featured Lifestyles,” which showcase the present-day and upcoming trends within staple lifestyle categories: the casually curated “Young Traditionalist” for an updated traditional lifestyle, the formal yet approachable “Duke & Duchess” for a traditional lifestyle, the bold and free spirited “World Traveler” for a global bohemian lifestyle, and the livable luxe “Urban Sophisticate” for a modern lifestyle. Each lifestyle is accompanied by vivid photography and descriptions of the new, emerging trends with the style category. The Surya Spaces Featured Lifestyles are part of the newly launched Surya Spaces initiative, a three-tiered collaborative design, style and inspirational resource, including a quarterly look book, an online image gallery and the four seasonal lifestyle trends. Users can shop the lifestyles at surya.com/suryaspaces. 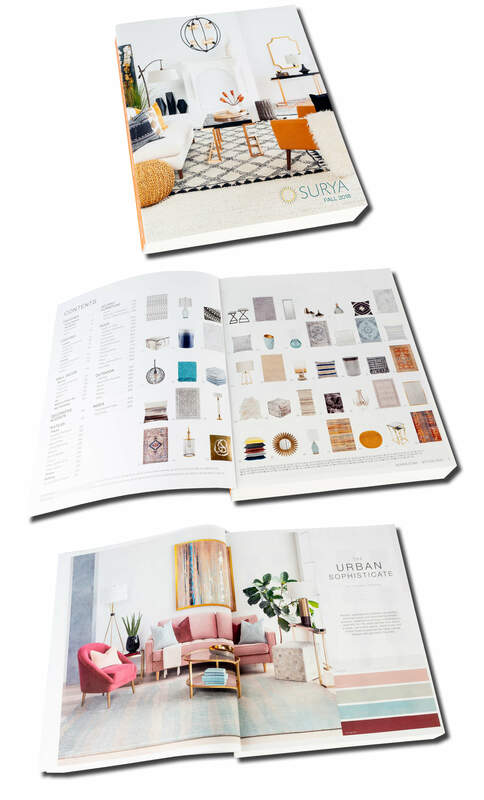 With more than 980 pages, Surya’s Fall 2018 Catalog provides a wealth of design possibilities that are intuitively organized by product category, style and price from high ($$$$$) to low ($). The visual indexes for Top Sellers and rugs further simplify the search process for current and potential customers. The catalog can also be used alongside surya.com for access additional product data and images, to monitor real-time product inventory, as well as place and track orders at any time on any day. Printed copies of the Fall 2018 Catalog can be requested from a Surya sales specialist. The eCatalog is available online at surya.com/ecatalog. View high-resolution images of the Fall 2018 Catalog here. Surya continues its tradition of providing exceptional educational and social events during the fall High Point Market. Over the course of five days, seven engaging programs will bring celebrity designers, industry influencers, CEU presentations, business development insight, networking events, and more to Showplace 4100. Friday, October 12. 4:00 p.m.
Kick-off your market with the new ASID NY Metro president Kim Radovich and guest designpreneurs as they discuss what attracted them to the home and design industry, what keeps them excited to go to work and how to stay positive and profitable. Join interior and product designers Michel Smith Boyd, Toma Clark Haines “The Antiques Diva”, Mary Douglas Drysdale, Xander Noori, and Keon Khajavi-Noori as they discuss where they seek inspiration, how they overcome the dreaded creative block, and give tips and tools for recharging your creative batteries. All ASID members are welcome to this members-only breakfast at the Surya showroom, followed by a showroom tour reviewing what is new and trending at Surya. Presented by Design Talk Live! A celebration with a fun twist. Mix and mingle with your favorite home, design and renovation personalities such as Kelli Ellis, Donna Moss, Tym DeSanto, Evette Rios, and Toma Clark Haines at Surya’s annual buyers-only Fall Celebration party. Enjoy hors d'oeuvres, cocktails and live music. Join Designers Today Magazine editor-in-chief Jane Dagmi and industry experts as they discuss topics such as managing client expectations, fostering genuine vendor relationships, determining service fees and writing the book of your dreams. Learn, connect and thrive among fellow designers at this unique speed-mentoring event with industry experts, followed by an evening of drinks, photos and relationship building. RSVP for Surya’s events today at tiny.cc/surya-high-point-fall2018. Breakfast, lunch, hors d’oeuvres, and cocktails will be served daily. Surya’s High Point showroom will be open from 8 a.m. to 8 p.m., beginning Friday, Oct. 12. Market attendees can schedule a personal, customized tour with a Surya sales specialist at surya.com/market-registration. For more information about Surya accessories, visit surya.com. As fall High Point Market approaches, Surya is announcing the addition of over 1,000 new accessories this season. 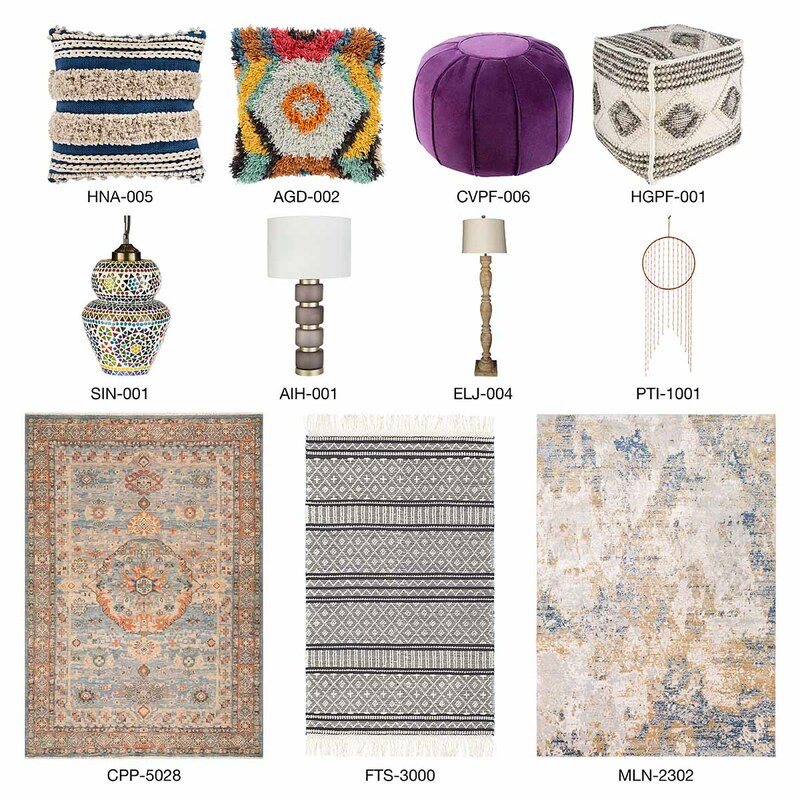 The Surya showroom, located at Showplace 4100, will display these new and expanded collections alongside hundreds of top sellers and customer favorites in styles ranging from traditional to modern to bohemian and more. Alpine: Machine woven in updated traditional and modern designs of varying shades of blue paired with cream and brown touches. Ararat: Updated traditional center medallion, Oushak and bordered designs machine woven in blue, orange, yellow and gray color palettes. Amelie: Machine woven in distressed, updated traditional designs with blues, grays, golds, and rust color palettes that provide a classic look with a modern twist. Bahar: Machine woven with high-low texture and grid lines in traditional, Moroccan and modern designs in the ever-popular blue-and-white and black-and-white palettes. Milano: Machine woven, modern abstract and updated traditional patterns in subdued color palettes with a high low texture for a modern luxury look. Mumbai: Machine woven collection includes distressed updated traditional and bohemian patterns in trendy colorways ranging from simple black and white to bold yellows and purples then to black and bright orange ombre looks. Quatro: Resembling a concrete mural worn over time, the machine woven collection has a gray base with bold, contrasting color and harsh distressed effects that resemble brushstrokes that bring modern style with a daring edge. Farmhouse Tassels: Hand woven, bohemian designs in colorways of neutrals paired with blue, black and gray for a contemporary appeal, while the high-low textured surface and long, 5-inch fringe add visual interest. Hygge: Hand woven, neutral colored rugs with high-low textures in traditional Nordic patterns. Coordinating poufs are also available for this collection. Napels: Hand woven with a blend of viscose, wool and cotton in neutral and brown, diamond lattice patterns with braided texture. Buenos Aires: Hand crafted, hair on hide rugs with no pile, shaped edges and navy blended among the dark brown animal hairs. A black and white colorway with metallic silver accents is also available. Patagonia: Hand crafted, hair on hide rugs with varying shades of gray and beige with a cream border. Panipat: Hand-hooked with both bold and subdued color palettes in updated traditional designs made of 100% wool. Piastrella: Hand tufted in uniquely distinctive, tiled mosaic designs across soft, neutral palettes. Cappadocia: New colorways of top-selling designs hand-knotted with 100% wool in low pile, traditional center medallion designs, updated traditional color palettes with fringe details. Surya's lighting category has grown exponentially in the last few years to include more than 700 designs across table, floor, task and ceiling lighting options in range of styles and price points. Emory: Pendant ceiling lights with casually spun, oil-rubbed bronze wire to create a multi dimensional nestlike design. Available in three different sizes. Santillian: Pendant ceiling lights with multicolored glass mosaic canopies with Moroccan-influence accented by an antique brass trim. Aminah: Modern, white or dark purple painted glass, tiered body table lamps with soft gold-toned fixtures and white linen drum shade. Elijah: Coordinating table and floor lamps with traditional style, natural and whitewashed, distressed bodies that provide a vintage, artisan-crafted aesthetic. Donia: Modern table lamps with round, hand finished iridescent glass bodies with a burnished satin brass that coordinate perfectly with Surya’s Donia accent vases. Small and large sizes available. Helena: Hand woven pillows with textural embellishments and fringe create an unmistakable bohemian look, while tapping into the popular blue, black and neutral color combinations. Emilio: Hand woven, embroidered pillows with colorful stitching for a global aesthetic. Santiago: Globally inspired, shag pillows in both multicolor and blue and white colorways. Hygge: Hand woven, neutral and gray colored poufs with high-low textures in traditional Nordic patterns Coordinating rugs also available. Cotton Velvet: The newest additions to the top-selling pouf collection features soft, rich navy and deep purple, cotton velvet material and round, global style with piping. Renzo: Hand woven, boho global pouf with multicolored cotton striped pattern. Yukon: Hand woven with 100% wool in a textured wrap style. Teresina: New wall hanging with high and low woven and looped textures in varying shades of gray and neutrals. Ponti: Burnt orange wall hanging hand crafted in a contemporary minimal aesthetic with subtle bohemian traits. Santiago: Hand-knotted wall hanging made of 100% wool in rich, vibrant yellow, oranges, greens, and blues that coordinate with the Santiago pillows. Surya’s High Point showroom will be open daily from 8 a.m. to 8 p.m., beginning Friday, Oct. 12. Market attendees can schedule a personal, customized tour with a Surya sales specialist at surya.com/market-registration. For more information about Surya accessories, visit surya.com. View high-resolution images of the Fall 2018 introductions here. Just in time for the Atlanta summer market, Surya announces the newest accessories additions to its extensive product offering. 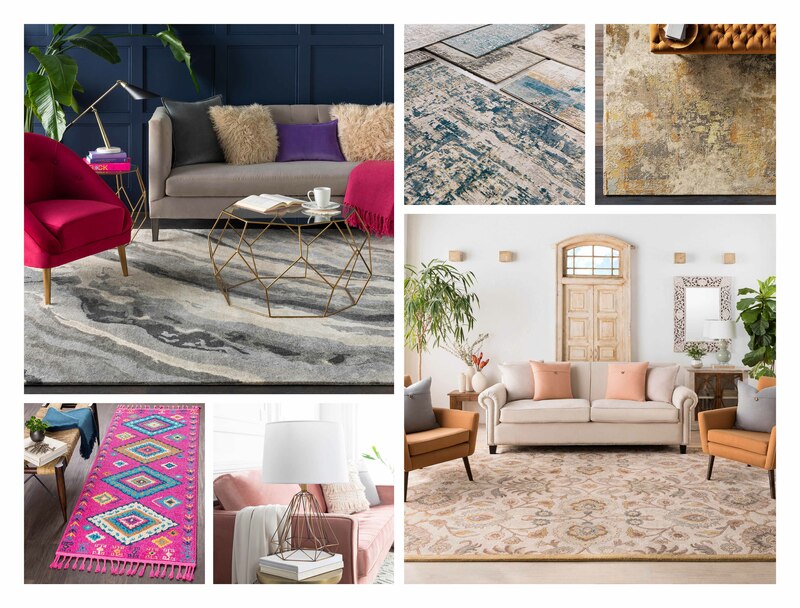 Located at 11-A-1 in AmericasMart, the Surya showroom will showcase the top color and design trends along with new product introductions across every category including rugs, lighting, accent furniture, wall décor and textiles. The new accessories are available in a range of price points, making curated, high-quality products accessible for all lifestyles. 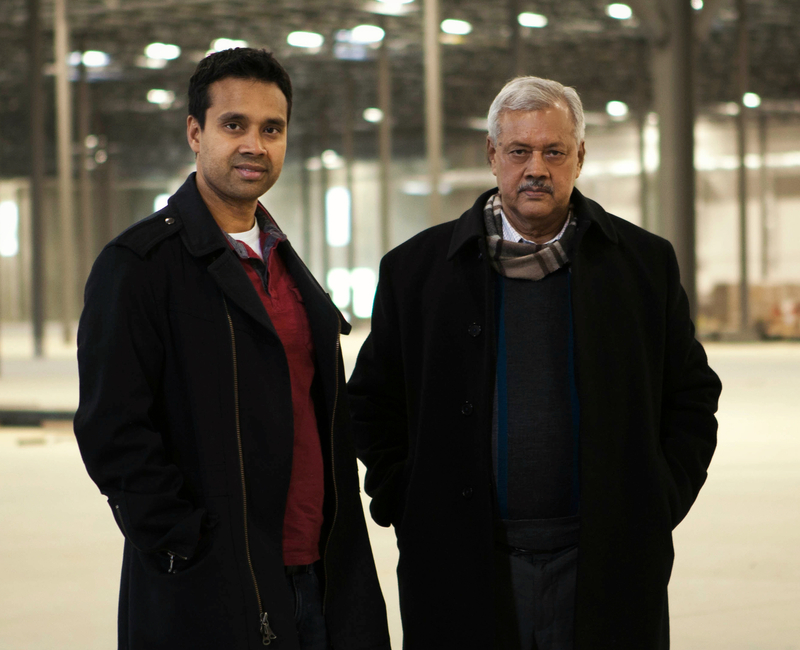 "At our core, Surya is a design company," says Satya Tiwari, president of Surya. "Our team works to identify the trends of the seasons and translate them into accessories that fit any lifestyle and budget. This market is no different. From the ceiling lighting to the technology used to create some of our new machine-made rug collections to the cross-category coordinating collections, we design with our customers and their customers in mind. I look forward to hearing their feedback during market." 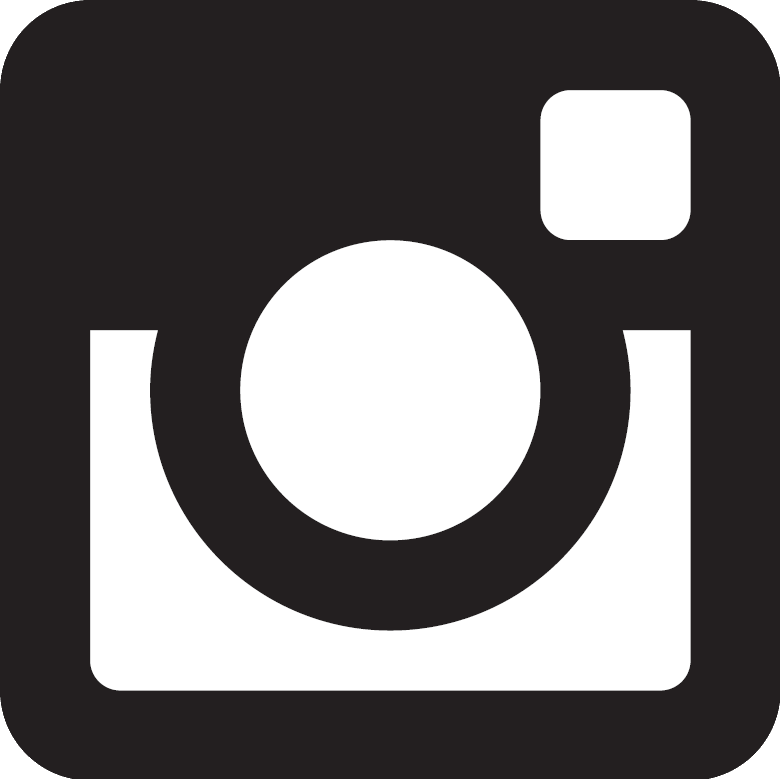 The winner will be announced on Surya’s Instagram profile, @suryasocial, on July 17, 2018. Aisha: The Aisha rug collection is machine made in modern abstract and distressed updated traditional designs in serene color palettes of blues, yellows and grays. Aesop: The machine-made Aesop rug collection includes updated traditional and global designs with carved details and a low pile in neutral brown, gray, blue, and cream tones. Herati: The Herati collection features updated traditional, machine-made designs in various shades of blues mixed with oranges, yellows, greens, reds, and violet. Mesopotamia: Shades of blue, gray and cream in updated traditional center medallions, painterly and bordered patterns create the subdued aesthetic of the Mesopotamia rug collection. Cash: The Cash collection comprises machine-made rug designs that provide cool, modern vibes through contemporary patterns with vintage distressing. Herkimer: The hand-knotted Herkimer rug collection is made of 100-percent wool in modern abstract designs with warm, deep color palettes mixed with cool blues and neutral tones. Robin: The Robin rug collection is hand tufted with viscose and wool in modern, textured and global patterns. Viva: Hand tufted with 100-percent wool, the Viva rug collection features traditional and transitional designs in vivid red, blue, black, navy, mustard, and green color palettes. Pyrenees: The hand-tufted Pyrenees rug collection has modern geometric designs in cool, subdued gray and beige hues, perfect for contemporary and transitional interiors. Tatyana: Art silk and jute are hand loomed together in brown, gray and blue solid and border designs to create the Tatyana rug collection. Haraz: The hand-woven, 100-percent jute Haraz rug collection captures the natural fiber texture in varying shades of light brown, orange and yellow, making it the perfect base for rug layering. Jambi: The natural jute fibers of the Jambi rug collection are hand woven to create a braided look with both striped and solid design options. Surya’s new lighting additions include timeless traditional, trendy modern and versatile transitional styles. Creed: The Creed table lamp has a square beige cotton shade and painted wood body with a connected medallion design for a transitional appeal. Dupree: The marbled glass body of the Dupree table lamp has a visually subtle texture, ideal for transitional spaces. Also comes with white linen drum shade. Newman: The traditional Newman table lamps have translucent glass bodies in clear and beige tones with a tan linen drum shade. Cross: The Cross table lamps have transitional, whitewashed tan and gray bodies with striped carving and beige and white cotton drum shades, respectively. Steele: The contemporary, prismatic bodies of the Steele table lamps have rose gold and brass finishes with white linen barrel shades - an exceptional fit for modern interiors. Surya’s textiles and accent furniture categories are also growing this summer with new global and modern additions as well as multi-category coordinating collections. Glitch: The modern, crushed velvet Glitch pillows are made of digitally printed viscose in light and dark, iridescent patterns with cotton backing. Metamorphosis: The floral and butterfly designs of the Metamorphosis pillows are made of cotton velvet material and have a piping outline. Copacetic: The coordinating pillows, poufs and throws of the Copacetic collection are woven with chenille-cotton blend material in solid orange, black and cream colorways. Ardley: The Ardley nesting accent tables are handcrafted with curved, wave-like legs in a gold finish and mirrored tabletop for a modern aesthetic. Surya’s showroom (11-A-1) at AmericasMart will be open daily from 8 a.m. to 8 p.m., beginning Tuesday, July 10. Market attendees are encouraged to schedule an appointment with a Surya accessories specialist at surya.com/market-registration. For more information about Surya’s rugs, lighting and accessories, visit surya.com. View high-resolution images of the Summer 2018 introductions here. 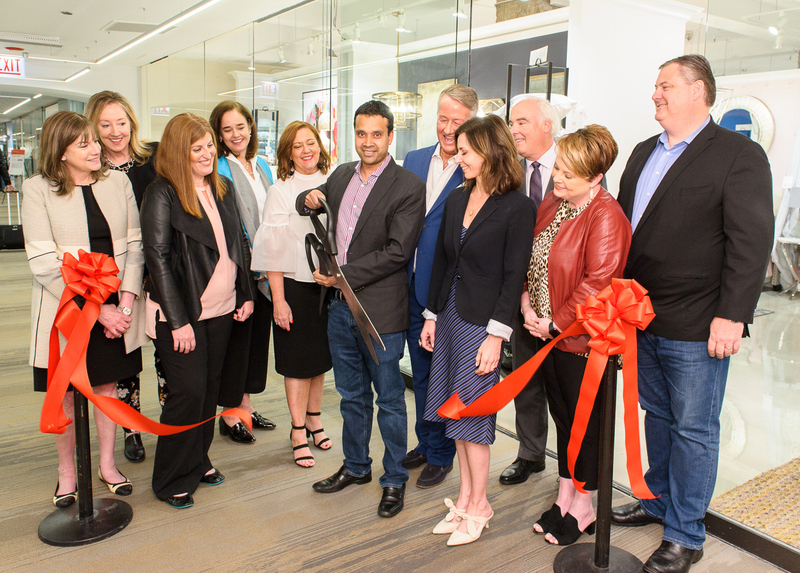 Surya is announcing the opening of its new 5,000-square-foot, to-the-trade Chicago showroom, located in Suite 619 at the Design Center at The Merchandise Mart (theMART). Building on the success of its year-round showrooms in Atlanta and Dallas, Surya’s Chicago showroom will offer designers a place to source and experience Surya products firsthand, and will serve as a platform for ongoing customer support, education and networking. Aiming to bring Surya accessories closer to its customers and better serve the design community, the brand’s Chicago showroom showcases a fashion-forward selection of its high-end accessories in a range of styles. Designers will be able to shop all of Surya’s luxury rugs, lighting, textiles, wall décor, accents, bedding, and more. Scattered throughout the showroom, inspirational lifestyle vignettes display the latest décor trends with coordinating Surya accessories. Designers will also be able to collaborate with their clients in designated workspaces outfitted with state-of-the-art technology. The showroom officially opened this week during Neocon with a ribbon cutting followed by an afternoon of events, including an educational CEU covering "A Guide to Area Rugs" and a champagne toast during the Design Center’s "Toast to Fine Design" event at NeoCon 50.
theMART is the world’s largest commercial building, wholesale design center at 4.2 million gross square feet, making it one of Chicago’s premier international business locations. Home to 15 major trade and consumer shows each year, theMART welcomes an average of 25,000 people each business day, which equates approximately 10 million people per year. Surya also has a seasonal showroom in High Point, N.C. and international showrooms in Toronto, Mexico City and New Delhi. For more information about Surya, visit surya.com. View images of Surya's Chicago showroom here. Design Center, located in Chicago's historic Merchandise Mart, is home to four floors constituting the world's largest and finest design center. As a leader in the $65 billion residential home furnishings market, Design Center offers the largest presentation of high-end, customizable, residential and outdoor home furnishings worldwide, all under one roof. Encompassing 750,000 square feet, boasting more than 125 showrooms and featuring more than 2,500 product lines, it is the ultimate resource for designers and design enthusiasts of luxury furniture, fabrics, floor coverings, wall coverings, lighting and much more. For more information, visit designcenter.com. Just in time for High Point Market, Surya announces the release of its Spring 2018 Catalog. With 989 pages, this season’s catalog is the company’s most comprehensive and easy-to-navigate catalog to date. It includes more than 1,600 new accessories in a range of styles and price points, an all-new ceiling lighting program, expanded accent furniture and wall hanging collections, and the most comprehensive rug offering across all constructions. Products are supported with enhanced data and showcased with inspirational imagery. Additionally, Surya’s Spring 2018 Catalog is a source of limitless inspiration featuring five trend spreads showcasing the current style movements in home fashion and interior design: mindfully crafted Desert, casual rustic Farmhouse, vibrantly expressive Havana, modern moody Disrupt, and timelessly refined Legacy. Large-scale photography highlights the intricate textures and patterns of Surya’s fashion-forward accessories within refreshing color palettes. In addition to the release of its spring catalog, Surya is also announcing the following exciting new program and service updates! Larger sizes have been added to more than 200 top-selling rugs, and 9’X12’ and 9’x13’ sizes are now available for more than 2,500 rugs – the largest selection of oversized rugs in the industry. To ensure the highest level of customer satisfaction, Surya is extending its return policy to 60 days. Printed copies of the Spring 2018 Catalog will be available during High Point Market at the Surya showroom, located at Showplace 4100 and open daily from 8 a.m. to 8 p.m., beginning Friday, April 13. Customers will receive printed copies in the mail in the coming weeks. The eCatalog is available online at surya.com/ecatalog. View high-resolution images of the catalog cover and selected pages here. Surya will reveal more than 400 new rugs, lamps and other accessories at the Spring High Point Market. 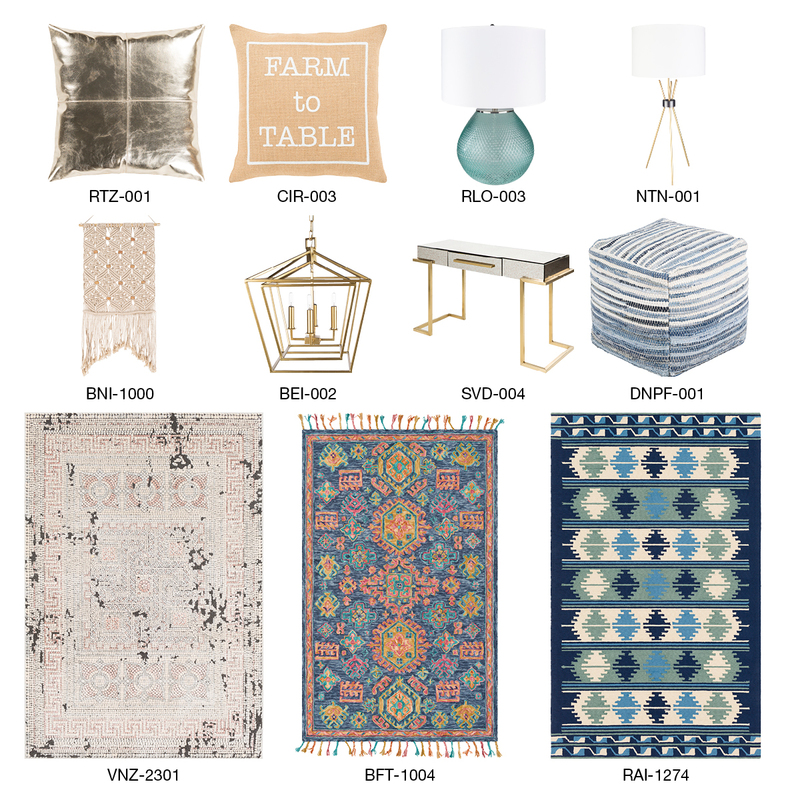 Located at Showplace 4100, the Surya showroom will feature new and expanded rug collections, an all-new ceiling lighting assortment, fresh wall hanging and accent furniture designs, and much more. A few of Surya’s new introductions are highlighted below. Surya’s lighting introductions include many new table and floor lamps as well as 50 pendant, chandelier and lantern style ceiling lights. Surya is introducing 15 new machine-made, hand-tufted and handcrafted rug collections this spring. Additionally, Surya will showcase extensions to more than 20 existing collections, including 50 new outdoor safe designs. Surya continues to add to its pillow offering, providing more options to quickly refresh the look of any space or coordinate with other Surya accessories. As a key extension to its wall decor offering, Surya will debut 18 new wall hangings this Spring. Surya’s accent furniture assortment continues to grow with the addition of several new coordinating accent tables, side tables and consoles. Surya’s showroom at Showplace 4100 will be open daily from 8 a.m. to 8 p.m., beginning Friday, April 13. Market attendees are encouraged to schedule an appointment with a Surya accessories specialist at www.surya.com/market-registration. For more information about Surya’s rugs and accessories, visit surya.com. For high-resolution images of all the Spring 2018 introductions, click here.